Indians like Salim Sheikh, who risked his own life to save the people, will never let the hate-mongers succeed in their dirty game of terror in the name of religion! 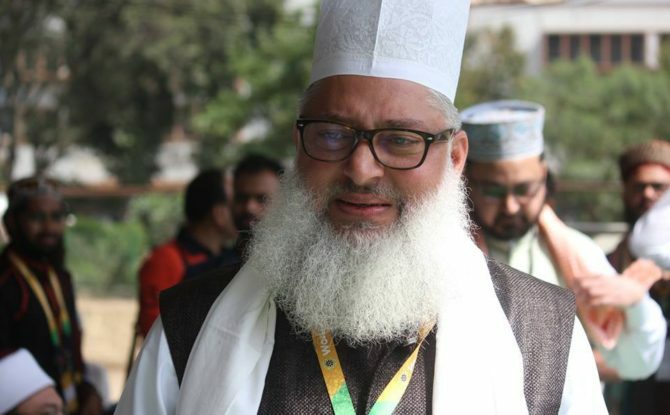 Mumbai: All India Ulama and Mshaikh Board’s founder and president Hazrat Maulana Syed Mohammad Ashraf Kichchawchvi has condemned the terror attacks on the Amarnath pilgrims, saying that the cowards are killing humanity. He said that terrorists have constantly been conspiring to spoil the peace of the country and to break our social affinity. He continued: we appeal to people to act patiently and diligently in such trying times. We should remember that by promoting hatred, we will help the terrorists in their ultimate goals and ulterior motives. He also said that in this difficult time we have to respond to those who spread hate, with an aim to save our country at all costs. Syed Mohammad Ashraf Kichchawchvi hailed the bus driver, Salim Sheikh while referring to his courageous struggle to save the lives of 50 people among the Amarnath pilgrims. He said that the brave Indians like Salim Sheikh, who risked his own life to save the people, will never let the hate-mongers succeed in their dirty game of terror in the name of religion. The government will have to pay attention to this so that there will be no such incidents in future, neither the mobs could take law in their hands anywhere in the country. Even if we love the country, we also have the responsibility to uphold its peace, otherwise, we are just showing off our patriotism or love for our country. We should try our level best to prevent the situation from escalating into becoming a reason for communal and religious strife. According to the teachings of Islam, the most important work in such a situation is to run a vigorous campaign for establishing communications, contacts and connections with our non-Muslim brothers and sisters. We should remove their misunderstandings and apprise them of the true teachings of Islam and enlighten them of its pristine message.We should raise our voice against oppression and injustice hand in hand with our non-Muslim brothers and sisters.